Will it fit? 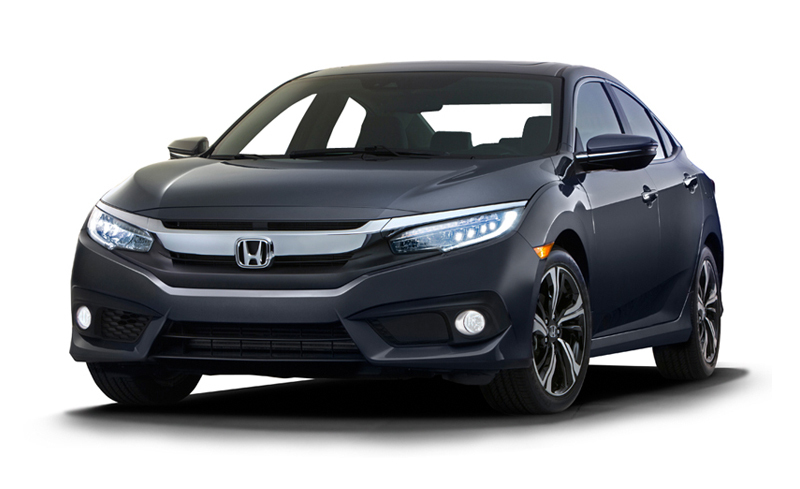 : Determining whether Honda’s new tiny hatch can fill its predecessor’s enormous shoes. If the personal-transportation choices of Americans were based solely on need and practicality, we’d have a much narrower spectrum of vehicles on our roads. From the hundreds of models available now, we’d need just four: 50-cc mopeds for single people, bitty five-door hatchbacks for couples, minivans for larger families, and pickups for those who pack nail guns or pilot a Ditch Witch. In fact, we’re pretty sure this is how they do it in Europe. 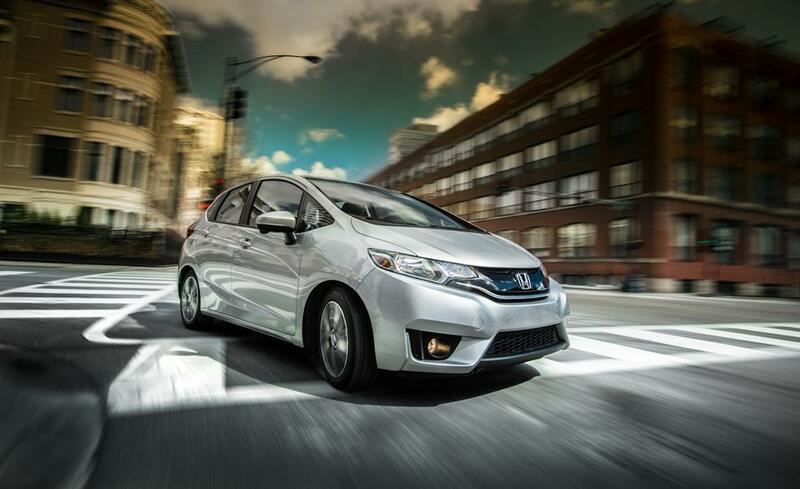 If they ever put us in charge, the Honda Fit will be mankind’s hatchback. 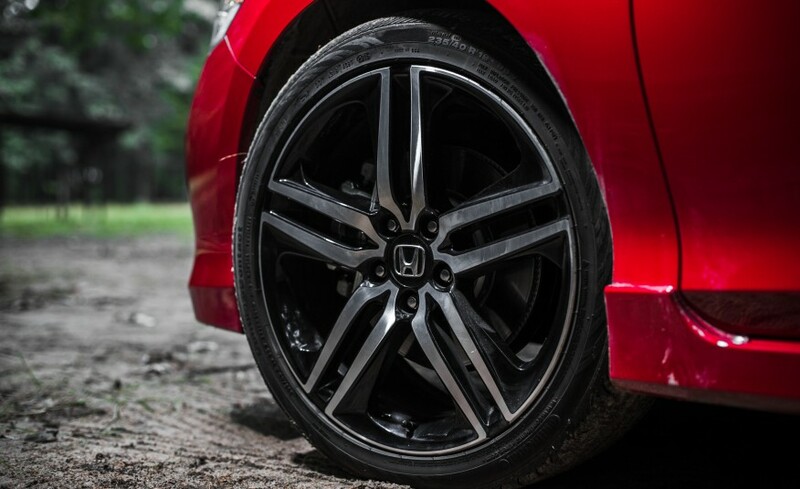 Since it appeared on the scene in 2006, the fun-size Honda has been our reflexive recommendation for pretty much everybody on a budget, including the old lady in the shoe. To date, this spacious, bodacious cube has pulled in seven 10Best trophies and three comparison-test wins. So its redesign for 2015 makes us nervous. Can the new Fit possibly live up to the untouchable standard set by the old? The 2015 Fit seems much bigger than its predecessor, but it is actually the same height, 1.6 inches shorter, and just 0.3 inch wider. The engorged appearance comes from a dramatically reduced glass-to-body ratio. The greenhouse is shorter, even if the car itself is not. This gives the Fit a more substantial appearance. And it is more substantial, although only slightly. This car’s curb weight of 2572 pounds is up 52 from the last Fit we tested. As far as cars are concerned, that’s just water weight. In spite of the small increase in mass, the car sees big gains in rigidity. It’s still a playful chassis for an affordable stuff-shuffler. There’s little roll, and wheel and body motions are well controlled even when you smack a mid-corner bump. 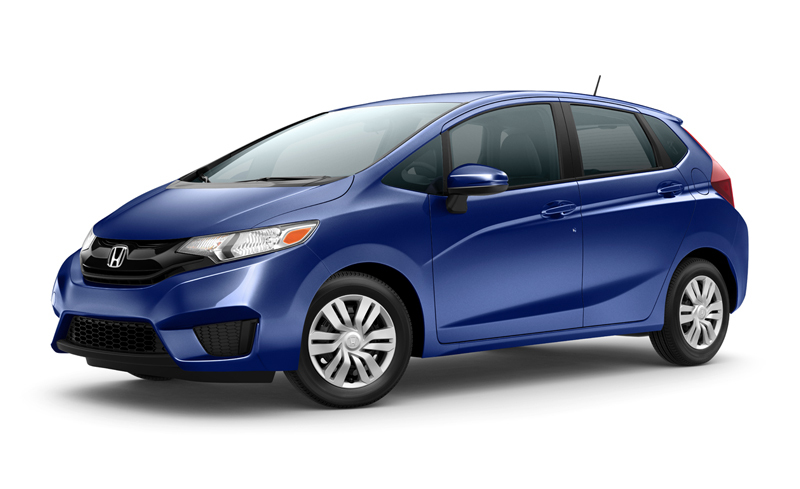 Without an available rear anti-roll bar like that on the outgoing Fit Sport, the 2015 model isn’t quite as neutral. 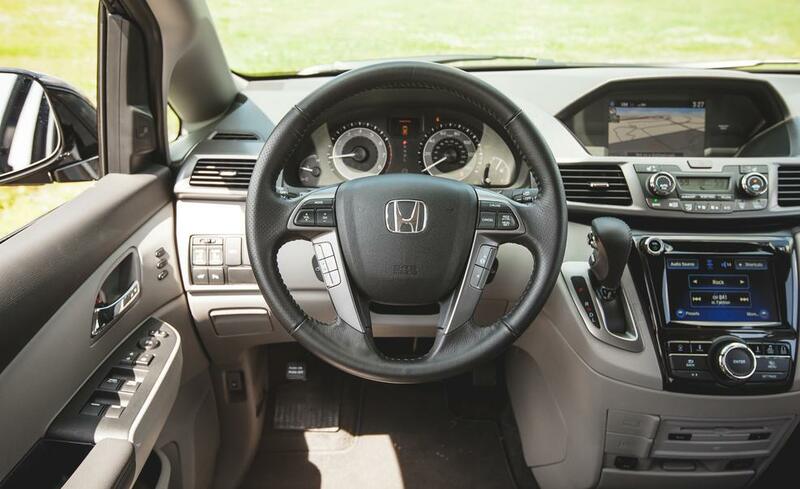 But it’s fun, and certainly more so than any of the nonexistent cars that offer a Fit-sized interior at this price. The rack-mounted electric power-steering motor takes orders from a sturdier shaft; while a modicum of feel remains, it’s a bit muted and less immediate than before, and this flattens the fun on turn-in. Both the 0.79-g skidpad grip and 178-foot stopping distance are average for its B-segment cohort (Chevy Sonic, Ford Fiesta, Mazda 2). But the brakes are actuated by a pedal that is squishier than the last Fit’s, again sapping a touch of the old car’s charm. There’s a shade less zeal underhood, too. While more powerful, the engine is missing the touch of rasp that reminded its driver of other high-profile VTEC screamers. It still displaces 1.5 liters, but that’s about it for similarities between Fit engines new and old. Now it’s stuffed with direct injection and dual overhead cams (where before there was port injection and just one lobestick). 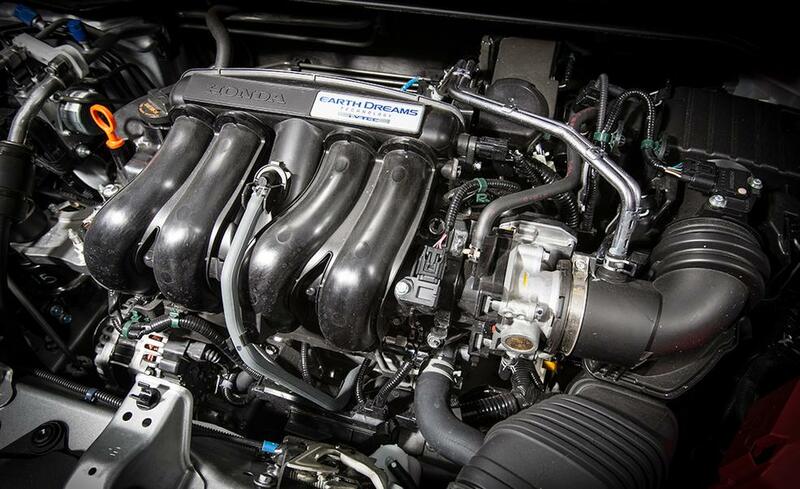 In addition to i-VTEC’s dual-profile intake cam, the 1.5 packs VTC, or Variable Timing Control, which retards intake valve timing at low rpm and advances it at high engine speeds. New oil jets cool the undersides of the pistons, and the crankshaft has been lightened 27 percent through smaller journals and a 50-percent reduction in counterweights, from eight to four. An additional 13 horsepower and 8 pound-feet of torque, for totals of 130 and 114, respectively, don’t sound like much gain for all of that effort, but this is just a 1.5. That increase in power and shorter gearing drop the zero-to-60-mph time from 8.4 seconds to 8.0. 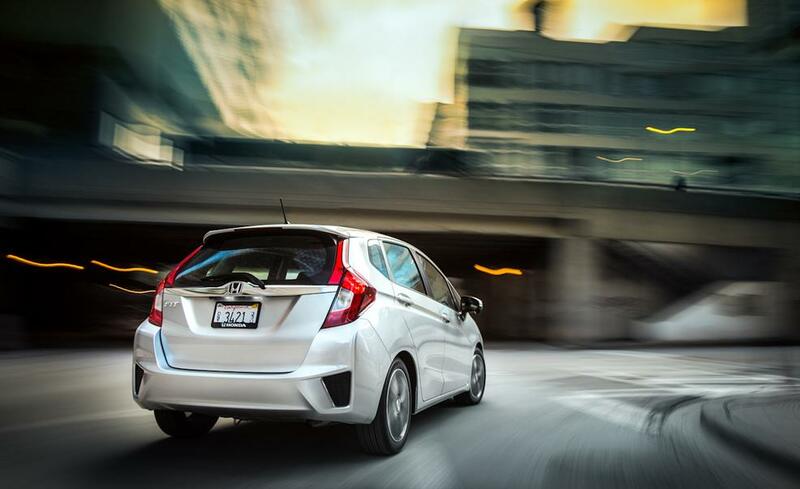 At 16.2 seconds and 86 mph in the quarter-mile, the Fit would have outrun every car in our last comparison test of this class [“Appetizers,” November 2011]. Fuel economy with the manual hits 29 mpg city and 37 highway. Shifting primarily at the 6800-rpm redline, we logged 30 mpg. Grabbing those shifts is both a joy and a frustration. The Fit finally gets a long-overdue sixth gear, and the shifter itself enjoys short throws and tight movements. But the clutch takeup is softer, more vague, and higher in the pedal’s travel than the previous Fit’s. And while there are six gears, sixth is the same ratio as the old fifth. 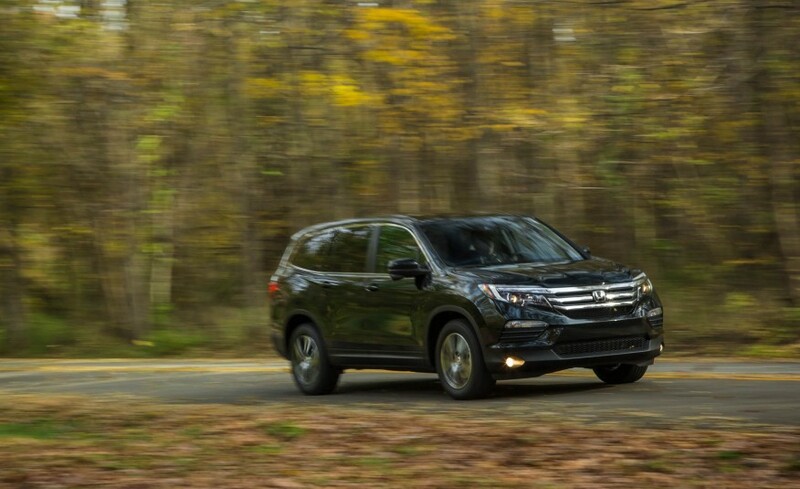 There’s no calming of the engine on the highway because the final-drive ratio is also the same. 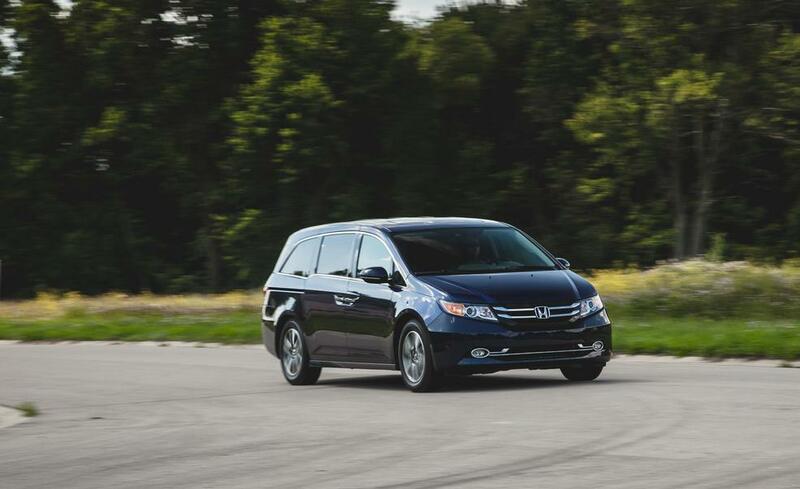 At 75 mph, the Fit’s four-pot turns a frenetic 3600 rpm. A Chevy Sonic turbo’s overall gearing in fourth is about the same as the Fit’s in sixth; at 75 in sixth, the torquier Sonic is turning 1300 fewer rpm. 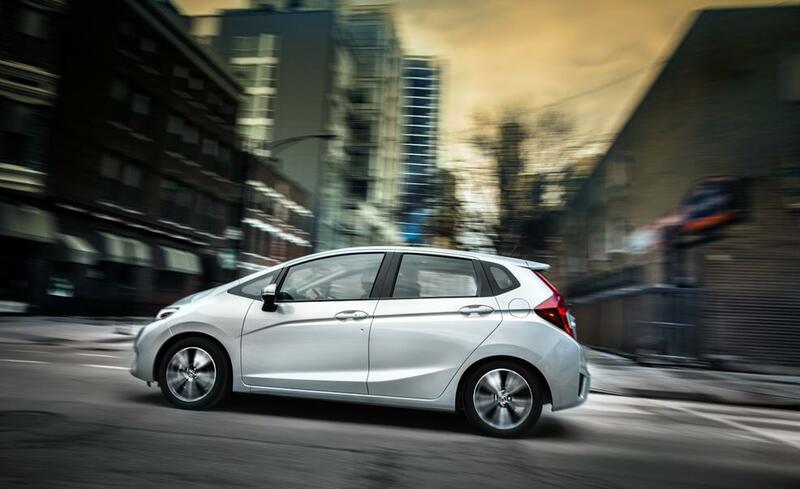 The Fit is no noisier than a Sonic, even if the high-rpm buzz gets tiring in a way that lower frequencies don’t. But while the Sonic and other classmates might challenge this new Fit dynamically, the Honda is still in a league of its own in terms of packaging, mainly because its fuel tank is still located under the front seats. Step inside and you’ll notice that its unexpected combo of downtown-friendly footprint and Penske-van interior volume has been dramatically reallocated. 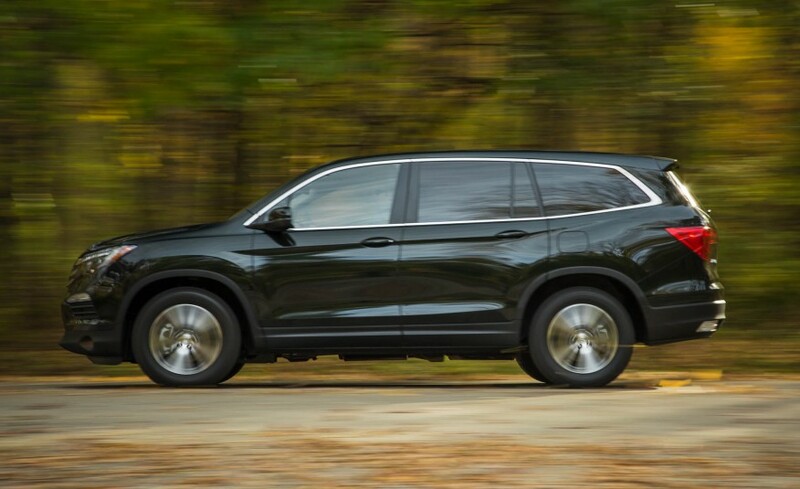 Honda stretched the wheelbase 1.2 inches and redesigned the rear suspension with shorter trailing arms, so the Fit’s rear seat is now an astounding 4.8 inches farther back from the front. That improvement is awfully close to the difference between long- and short-wheelbase Audi A8s or BMW 7-series. 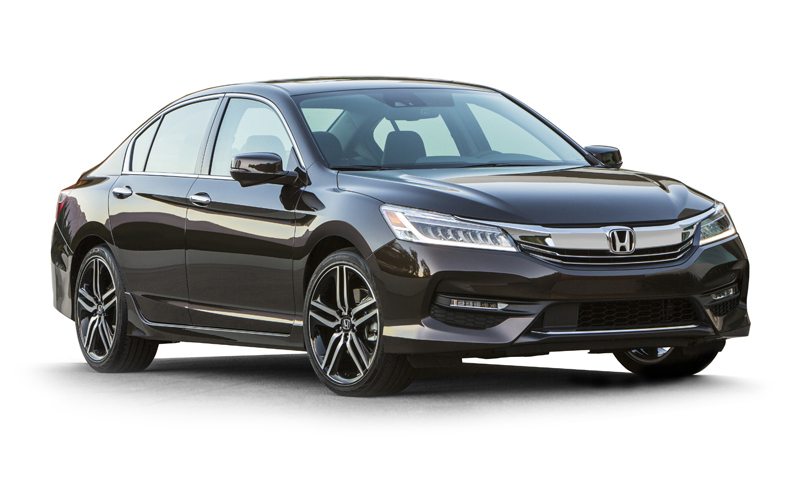 Never mind the one-size-up Civic; the Fit now has more rear-seat legroom than the already limo-like Accord. This is no less of a miracle than the packaging breakthrough that made the first Fit such a hit. Of course, there is a trade-off. 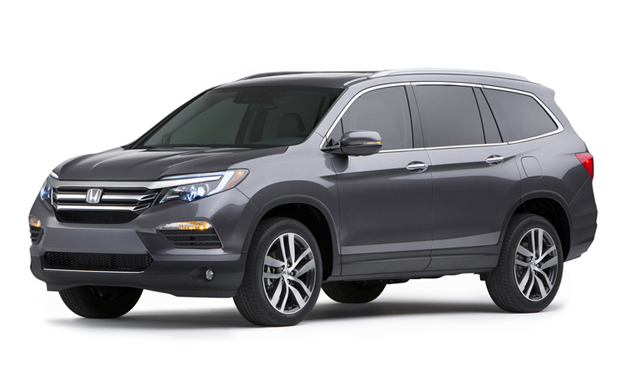 Honda netted more people space at the expense of cargo room. The volume behind the rear seat drops from 21 cubic feet to 17, relegating what was once the segment leader to midpack standing. 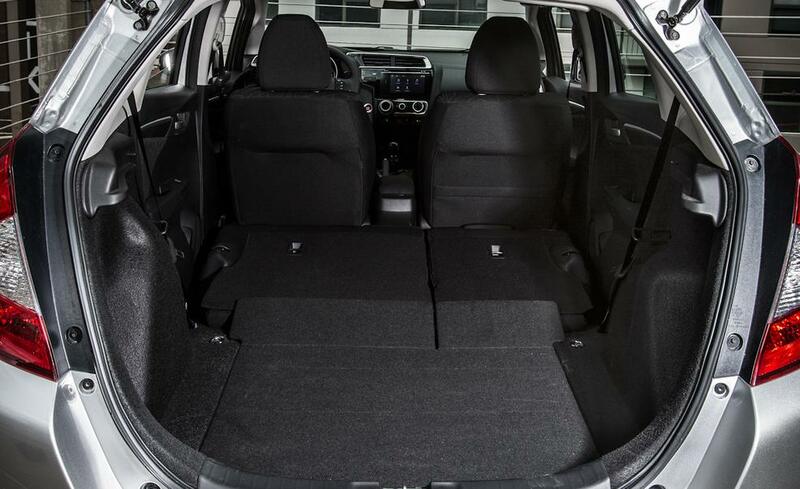 But dropping the Fit’s rear seats creates a cargo hold that, while smaller than its predecessor’s (53 cubes versus 57), is still bigger than that of any competitor in our last roundup. It’s more than you’ll find if you fold down the third row in a GMC Yukon. Unless your friends are mostly bags of mulch, though, it’s hard to view the shuffling of interior space as a negative. Particularly when there’s still so much of it. 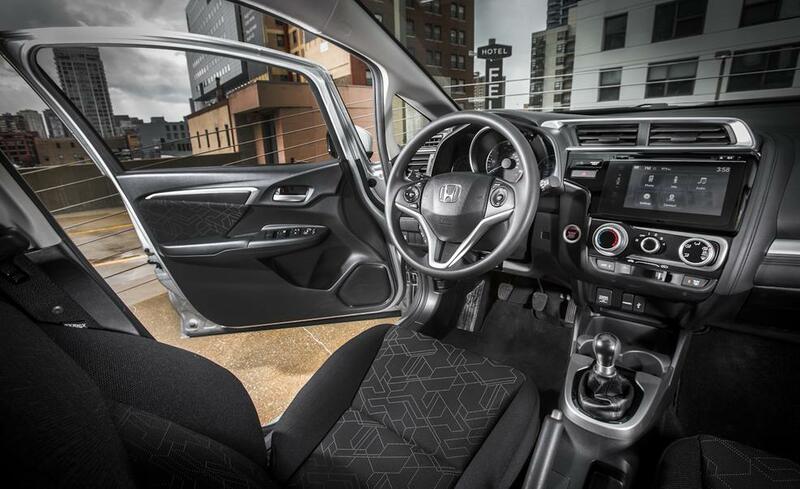 But it’s not only more spacious; this Fit enjoys a marked uptick in material quality and design. The doors and dash boast luxurious soft-touch panels; and matte-finish “fauxluminum” flourishes accent the dash, door handles, and air vents. Along with the upgrade in appearance comes an upgrade in standard and available equipment. Not that the new bodywork limits visibility that much, but a rearview camera is standard. 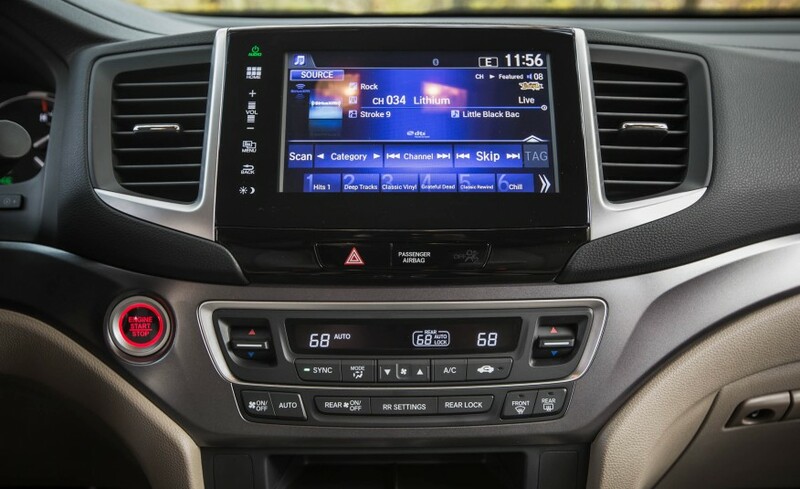 Keyless-entry and -start and—finally—satellite radio are now optional. 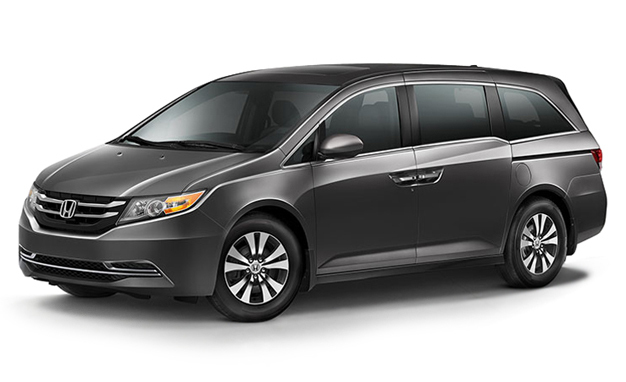 The base car starts just $100 higher, at $16,315. Fully loaded models outpace the last generation by about $1000, but the extra content is worth it. The new Fit has us torn. Its edge has been slightly dulled, leaving the handling a little less sharp and the engine note a touch less provocative. The clutch takeup is muddier and the brakes are a little squishier. We hate to see a beloved car even feint in the direction of dynamic mediocrity, but at least the soul of the Fit has survived. Its practical improvements are remarkable, putting the car even further ahead of its class. 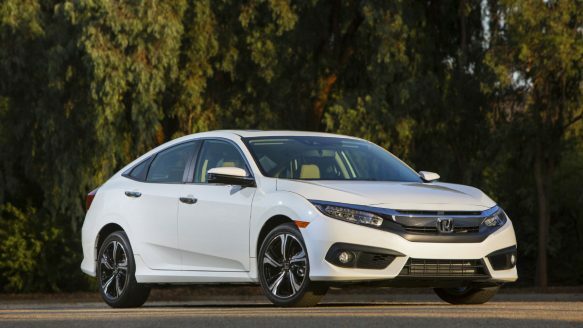 Nobody has yet matched the Honda’s incredible versatility at this price, nor has any competitor yet packaged anything remotely as useful atop a chassis that offers this much fun for so little money. This entry was posted in Fit Articles on February 29, 2016 by Administrator. 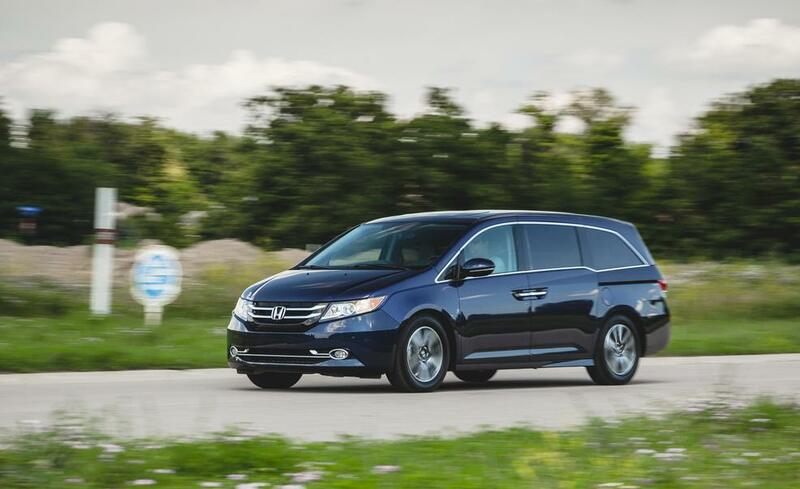 Still the cr�me de la cr�me of minivans. This entry was posted in Odyssey Articles on February 29, 2016 by Administrator. 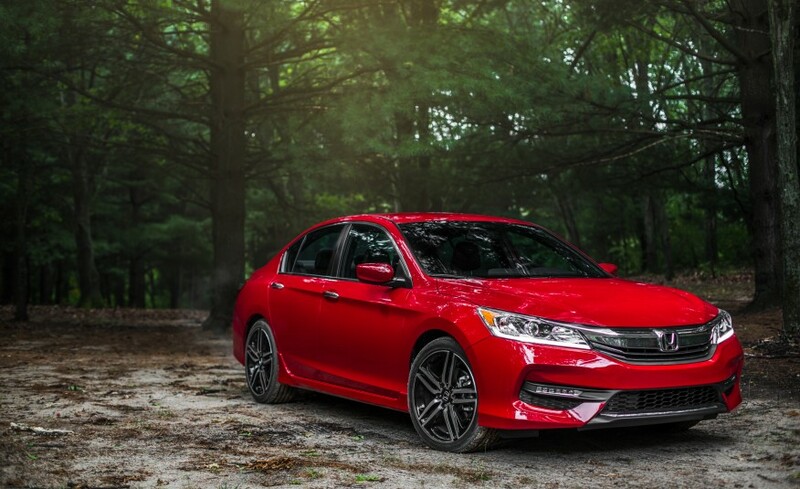 The playful and engaging Accord offers more than you’d expect, which helps make it a 10Best winner for 2016. 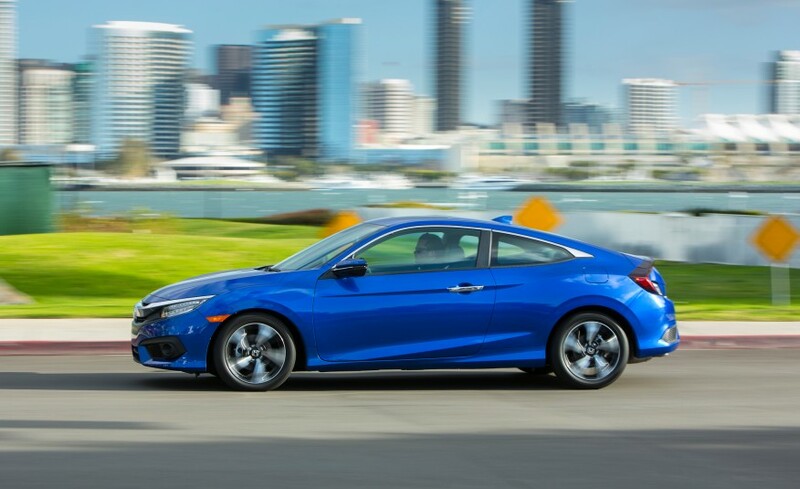 A 185-hp 2.4-liter four and a six-speed manual are standard in both the coupe and sedan; Sport models get a slight bump to 189 hp. 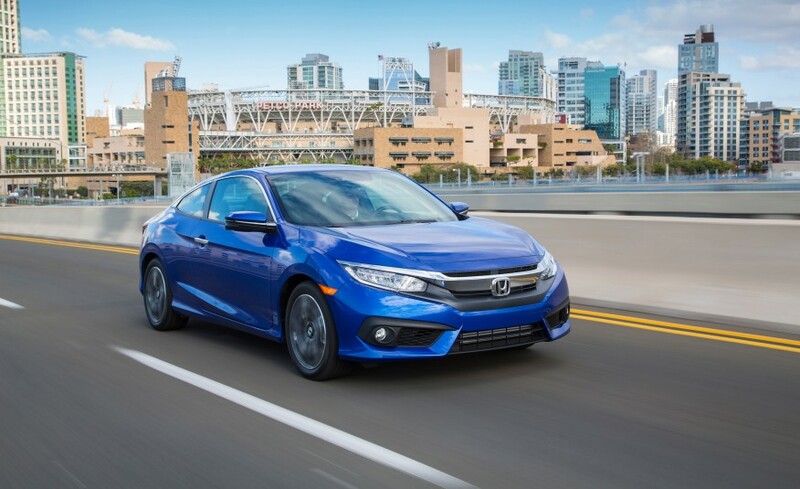 A CVT is optional, as is a 278-hp 3.5-liter V-6 with a six-speed automatic; the coupe offers a six-speed manual—our choice. EX and above models feature Apple CarPlay and Android Auto, but some may find the button-less infotainment system annoying and fussy. This entry was posted in Accord Articles on February 29, 2016 by Administrator.